With over 85% of our management staff LEED accredited and with a corporate commitment to the future of our planet, Kaplan Construction has fully embraced sustainable building. We realize the impact our industry has on the environment and we strive to improve our practices on a daily basis to minimize negative environmental effects. Sustainable construction practices such as the use of repurposed building materials, energy efficient HVAC systems, and photovoltaic infrastructure provide economic advantages for our clients as well as for the environment. 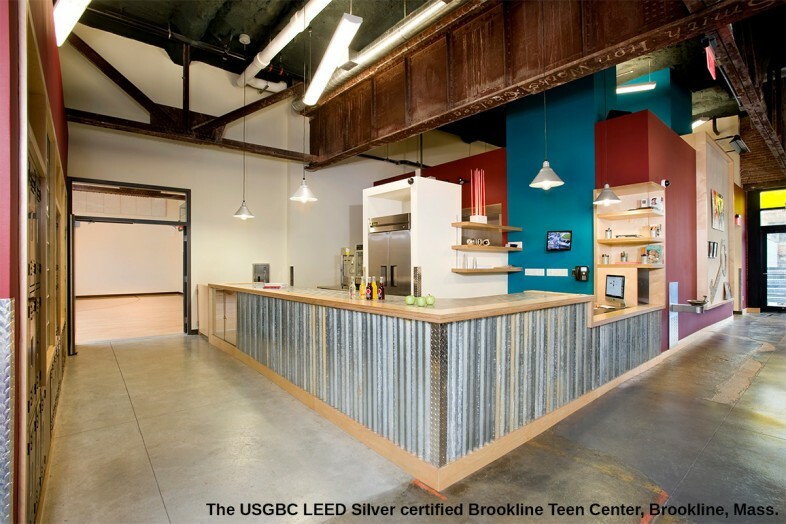 The LEED Silver certified Brookline Teen Center is our latest achievement representing Kaplan’s commitment to responsible building. Over the four year preconstruction process, we continually weighed sustainable design options and achieved the challenging task of building a project that was LEED worthy despite having limited financial resources. Elements of the building program included the use of locally manufactured and harvested materials, water efficient fixtures, and optimized energy efficiency of the building through HVAC, lighting, and building envelope upgrades. Other LEED credits were obtained from the diversion of construction waste from landfills, FSC certified wood, specifying materials with high recycled content, as well as creative reuse of materials – such as the use of highway guardrails for railing systems. Using lean construction practices in conjunction with sustainable building strategies, we are able to fulfill our commitment to the environment as well as satisfy our clients’ needs for cost efficient and environmentally sensitive projects.